? [ref] F. Mercier et al. / Journal of Electron Spectroscopy and Related Phenomena 150 (2005) 21-26? Suspecting the element samarium was contami- nated with an unknown element, E. Antole, a French chemist, discovered europium in 1896. 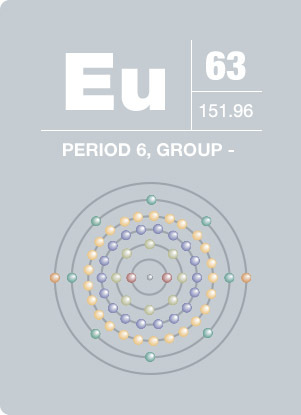 Europium is known for being the most reactive of the rare earth elements. The element is about as hard as lead and quite ductile. Europium has been used to dope plastics to make lasers, but there are no widely used commercial applications for the element. Due to its ability to absorb neutrons, europium oxide is widely used as a red phosphor in television sets and as an activator for yttrium-based phosphors. The element is also used as an agent to manufacture fluorescent glass.